We’ve got winter storm warnings today all over the place. In my little spot in Jackson, I’ve noticed a very little bit of snow and, maybe, sleet. I am hoping the predicted 1/4 to 1/2 inch of ice does NOT accumulate. I’d rather the tree branches and power lines stay intact. 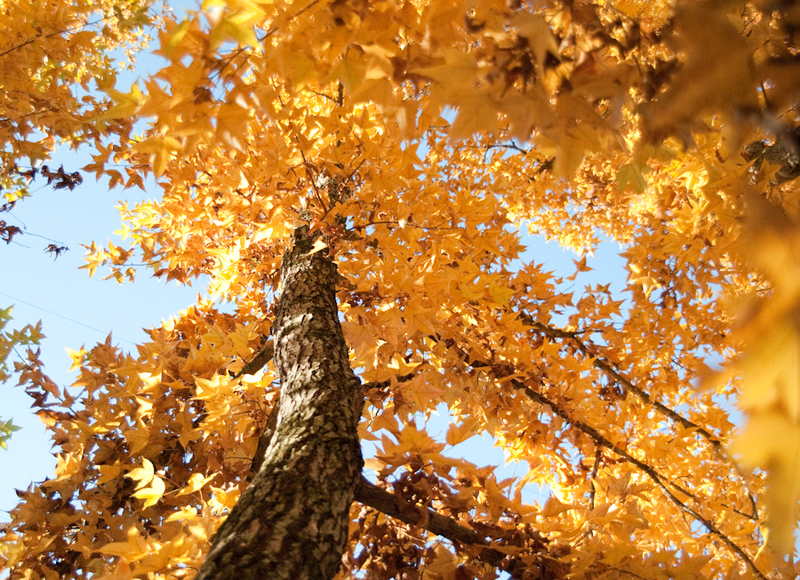 This photograph was taken in December 2009, when the two trees that mark the entrance to my driveway were in glorious color. This will have to be my sunshine today. Am inspired to work again on the work-in-progress. I want it to shine like these leaves in the sun. 6-10:30 a.m. Rise, walk dog with Richard, prepare boys’ lunch, walk dog with friend, Pilates. 10:40 -11:05 a.m. Conversation with filmmaker (who happens also to be a friend) about script for book trailer. Glad to be working with a professional. Moving images and audio are way out of my area of expertise. Grateful for grant from state and local arts agencies that made it possible for me to hire professional filmmakers for my book trailer. 11:35-11:55 a.m. Start blog post for later this week, featuring an interview with video. 12:00-1:00 p.m. Re-heat lunch and eat with Richard. Sneak downstairs to computer for a minute to email some links and a still photograph to filmmaker. 2:35- 3:02 p.m. Put finishing touches on blog post. 3:02 p.m. Email from magazine editor. Needs phone conference on piece slated for August. Reply that I am free until 3:50 p.m. when I must collect two younger boys from school. 3:05 – 3:35 p.m. Tie three split chicken breasts around two onions and two sprigs of fresh rosemary. Rub with olive oil, more rosemary, and some thyme. Editor calls. Use cordless phones and headset to discuss magazine piece. Concerns must be answered. A potential re-write angle is discussed. Editor promises to email the potential new angle. I promise to think — and figure out a direction by noon next day. 3:45 p.m. Start oven preheating. Bundle up for unseasonably cold weather. Gloves, hat, scarf, fleece. Go to door to let my oldest son in. “Is it that cold inside?” he asks. G’s always a bright spot in my day. 3:50 p.m. Pick up younger boys at school. Conference with teacher about blazers that need to be purchased with booster club monies. I am the keeper of the booster club monies, but I forgot to bring the total. Her computer is down and the Blazer company’s phone line is busy. We agree to talk next day. I promise her we have enough money for 5 blazers — even though I don’t know how much money we have, nor the exact cost. 4:30 p.m. Home. Put chicken in oven. Peel white and sweet potatoes. Add to roasting pan. 4:50 p.m. Print potential re-write angle. Call critique partner to see if she can brainstorm later. Make 6:30 p.m. appointment. Sit in living room chair to consider rewrite. 5 p.m. Place call to editor — even though it is an hour after close on the East Coast. Editor at desk. (They work long hours.) Convey my belief that rewrite angle is bad idea, but promise to try something later. 5:10 p.m Wash and trim asparagus for steaming. Cut the chicken while Richard makes gravy. 5:30 p.m Sit down to roast chicken, potatoes, steamed asparagus, and gravy. 5:55 p.m. Walk dog with Richard. One boy does dishes, one boy feeds dog and takes out trash, and one waters the plants. 6:30 p.m. Home just in time for call with critique partner. Not really much brainstorming. I’ve decided I can’t rewrite from proposed angle. Back and forth. Discuss a small bit of school business. 6:45 p.m. Sit at computer. Bring up final, edited version of magazine piece. Pull out a few research sources, search internet for more information. Become more firm in my position that proposed angle won’t work. Write email to editor. At a loss for how to proceed. Suggest scrapping article or pulling byline. Am out of ideas. Give morning schedule so editor can reach me. 7:45 p.m. Read to D from Shadow’s Edge. 8:30 p.m. Seek to connect with N about science fair project that is causing problems. He’s in no mood for it. 8:30 – 9:30 p.m. A little kitchen tidying, a little web browsing. Eat popcorn with nice, warm cup of tea. 10 p.m. Asleep. 6:54 a.m. Editor replies via email. Editor ready to throw in towel, too, but only temporarily. Will sub another article for August. Will work through issues somehow. 9:30 a.m. Take model airplane to school so youngest son will have it for Science Olympiad after school. 9:45 a.m. Re-heat black-eyed peas prepared two days ago for today’s church lunch for the food pantry customers. 10:50 a.m. Hand off black-eyed peas to friend who is attending lunch. 11 a.m. 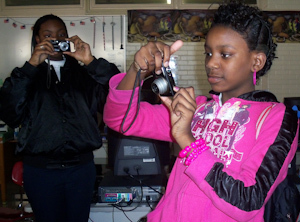 Prepare lesson on transferring digital photographs for 5th graders. Review script and time line from filmmakers. Field email query about macro lens. 12 noon. Eat reheated soup for lunch. 12:10 -3:45 p.m. Teach 5th graders. Computer glitch makes it impossible to transfer photos so we take more photographs. Meet with teacher after school. 3:50-4:10 p.m. 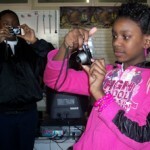 Transfer students’ digital photographs to my computer. 4:15 p.m. Head to Post Office to send check for Blazers via Priority Mail. 4:50 – 5:20 p.m. Home. Brief chat with Richard about the day. 5:20 p.m. Take G to piano lesson. While he’s having lesson, run to library to get book. 6:10 p.m. Home to Richard’s tasty pasta salad (quinoa salad for me because I eat gluten-free). Walk dog. Kids do chores. Blog. Review script with Richard. 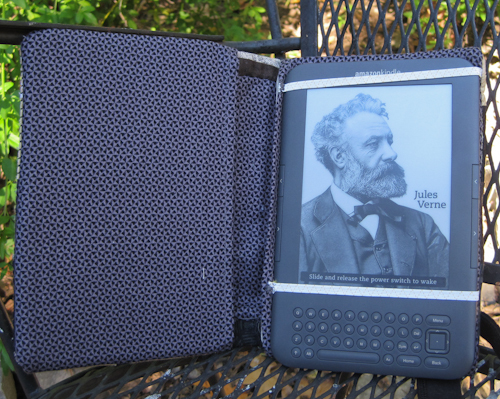 Read to Douglas. Sleep. Our two copies of Growing Patterns: Fibonacci Numbers in Nature arrived today. The books are beautiful! The colors are bright, the pages are shiny, and the shape is a golden rectangle. After getting some positive feedback on using video on the blog, I decided that this would be a good day to use it again. You can watch the brief video below and then read on for more information. From my early days of writing for children, I have always read what I was working on to kids. At first, it was my own. Then, I moved on to sharing with kids at my kids’ school. In addition to reading my stories and poems, I read all kinds of books to small groups and entire classrooms. I could tell from the kids’ reactions what was working and what was not. I learned, too, that kids are not willing to sit still for version after version of the same story. I learned to get my stories into pretty good shape before I shared and to read once and move on. One of the spreads in Wolfsnail: A Backyard Predator is in the book because of questions I got from kids when I went to schools with my Highlights article about wolfsnails. Kids always asked if wolfsnails eat worms. I created a scene in which a wolfsnail encounters a worm (and does not eat it) so that I could answer the question in the text. With Growing Patterns I pushed my luck with a few of the young readers, asking them to read it aloud to me. I know they felt a little nervous, but I kept my mouth shut and tried not to be too obvious about the notes I was taking. I was watching for places where they stumbled over my awkward constructions or where they needed more clarification. Two second graders wrote out a page of questions for me. Many of the questions were about how I took the photographs or got interested in the pattern. But they also pointed out their favorite photographs and patterns. I am very excited about going back to their school this week and showing these now third graders the final product. 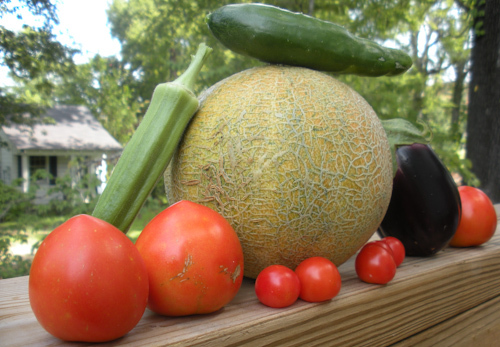 Today marks my most varied (and abundant) harvest from the garden: a cantaloupe, an eggplant, an okra, a cucumber, and two kinds of tomatoes. Yum! The okra, eggplant, and tomatoes went into a side dish for lunch. How far we’ve come from the first seedlings . Today’s other news is that Growing Patterns: Fibonacci Numbers in Nature is very nearly finished. I never think I’ll ever get to this point with a book, but I almost can’t bear to look at it one more time. (My editor reported dashing across to the other building on the Boyds Mills campus to write final changes into a final proof.) I know this feeling will pass. It is beautiful and I’m grateful for everyone who has helped it get to this point. Now, it’s time for it to be a book. Already. The seed for this book started germinating in February 2008 at an SCBWI/Southern Breeze conference. 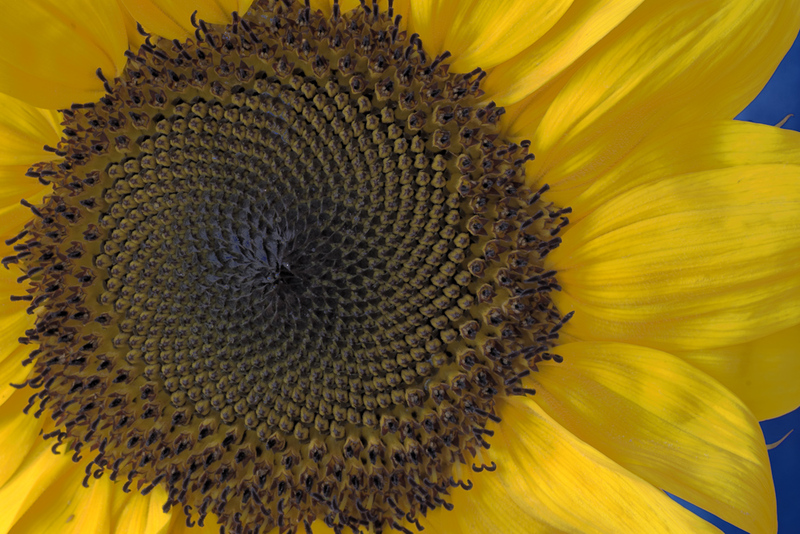 A proof of Growing Patterns: Fibonacci Numbers in Nature arrived in my inbox on Friday. I printed it because I can’t really reivew a book unless I can page through it. Richard and I found a few things that need fixing and we’ve weighed in on some design decisions. The photo you see at the left is on the cover. I am very excited about seeing it as a book. I took it to some of my young readers and they read it for me so I could watch for things like line breaks, etc. I also sent it off to my expert reviewer. It is getting so close, now. Yipee! We had a few glitches this weekend on the website. It disappeared during an attempted upgrade. Richard got the backup restored today. We’re still having to recreate a few things that had gone up between the last backup and the disappearance. I think I’ve got it: Lyre-leaved sage. I found it on pp. 56-57 of George H. Dukes, Jr.’s The Gardener’s Guide to Mississippi Wildflowers. Then I confirmed by surfing the web for more pictures and descriptions. 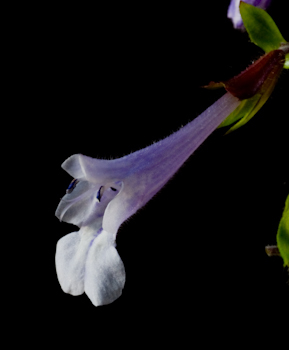 The scientific name is Salvia lyrata. A common name is cancer weed. 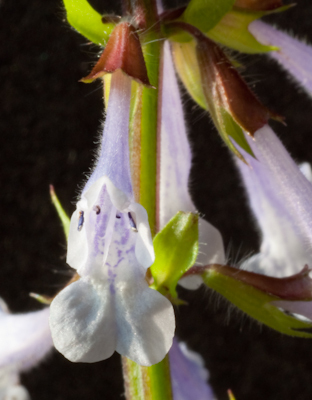 Salvia is from Latin salveo, meaning to save or heal. Here is the photo we are considering for the book. This flower has a funnel-shaped corolla with lobes. Corolla is a collective term for petals, which may be arranged in a regular or irregular way. When regular, all the same parts of a flower are alike in size or shape and may be cut along more than one line to obtain mirror images. When irregular, the flower is either totally asymmetrical or, if cut along only one axis, will reveal bilateral symmetry. So, it seems to me that this Lyre-leaved sage is an irregular funnel-shaped corolla with two lobes on the lower part. 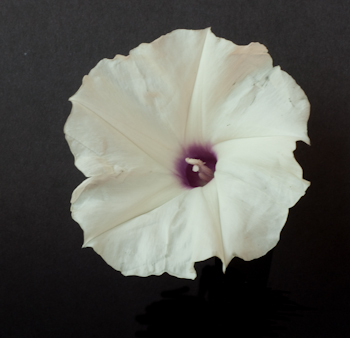 This is a flower from a wild potato vine. Its corolla has five fused petals and there is purple at the center of the funnel. I love these delicate flowers. I see them on my daily walk. The vines grown wild near the bridge over our neighborhood creek. Does any one of these images say one to you? 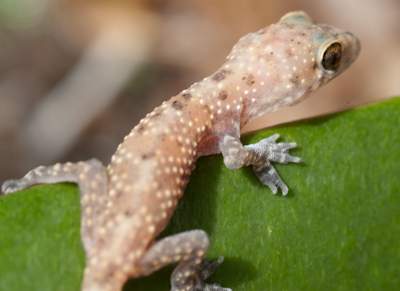 Here’s our gecko in its habitat. It’s a crafty little critter. We’ve found that it stays still for a few moments, but it moves with lightning speed when it decides to move. Richard took these. We watched its tongue moving in and out as it seemed to be lapping up water droplets, but by the time Richard had repositioned the camera, it was gone. 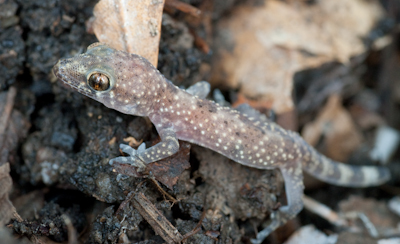 We have a few blurry images of its head and its legs. I love seeing its coloring up close. I also like its little toes. I’ve been dousing its habitat with spring water and I moved it off of the screened porch and onto the deck so it’d have access to flying insects. Since we took these, however, I haven’t caught a glimpse of it. One of the boys found a small toad and I added it to the habitat. We haven’t seen the toad either. My editor has a rough layout of Growing Patterns from the art department! He went through the book and came up with a handful of questions and/or comments. I was able to answer most of them easily. He wants to see a few more photographs. We need another example of a one-petal flower, a different photograph of an amaryllis (from a slightly different angle) and, perhaps, a different example of a four-petal flower. As I was going back through the photographs in the “Fibonacci” category in Lightroom, I came across the above photograph. I think Richard took it. I’m glad I found it. 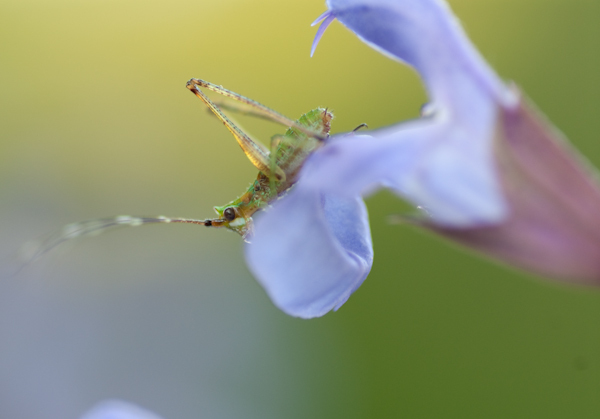 It won’t serve our needs as a flower photograph, but the bug is really cool. Does anyone know the name of this flower? It is a wildflower and it blooms in April (or was blooming in April 2008, anyway). I’ve scoured the two books I have on Mississippi wildflowers and have come up blank. The questions at this point in a nonfiction book’s process get very tricky, I’ve found. Once editors and writers face having something printed (that means forever, right), we start getting really nervous about having everything right, right, right. Because I am trying to write about a complex subject in a clear way, I sometimes simplify to the point of making something wrong. This is what we’re trying to avoid. Experts can be a big help in this regard — or they can muddy the water. Before starting this project, I had no idea how many different words there are for petals (corolla, ray flowers, disc flowers). What a layperson calls a petal may actually be another part of the flower that has taken on petal-like attributes such as color. You see what I mean? At this point, it is very easy to get lost in the trees … and miss the forest. But, we’re close. 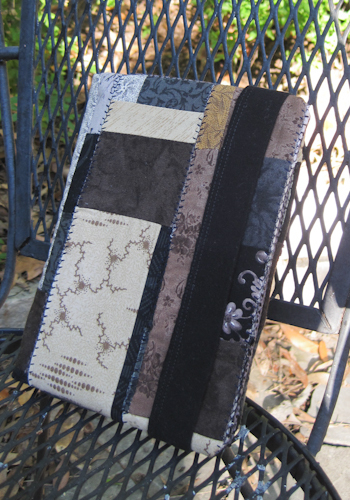 Here is one of the busier pages of the Growing Patterns manuscript. My editor and I are trying to solve a problem. As part of my school and library visit program, I share the close-to-final mansucript for Wolfsnail: A Backyard Predator. 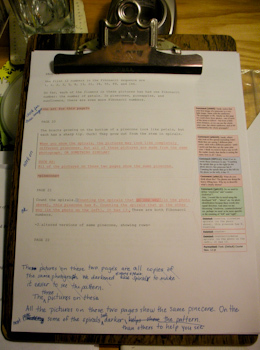 I want students to see that the process of writing (and re-writing) keeps on going right up until the book is printed. I took a picture of this page to let you see our notes back and forth in the Word tracking feature. In this latest back-and-forth between Andy and me, he’s asked for some more photographs. In the book, Richard and I use close-up macro photographs and Andy wants to include some photographs that show the entire objects, too. I’ve sent him some options. We’re also trying to make sure that readers understand that a particular set of photographs is actually three copies of the same image. We’ve done some digital manipulation to highlight a pattern. Some people who have looked at the dummy have thought the three images were of three different examples of the same object. I think we’re getting close to a solution. One of the things that is helping during this revision is that I am still doing school and library visits with Wolfsnail so I have been reading drafts of Growing Patterns to the kids I meet. I get such good feedback by watching their faces and hearing their questions. Richard and I got a nice (and unexpected) mention today on a blog I read regularly, I.N.K. : Interesting Nonfiction for Kids. Here is one section of an exchange between author Loreen Leedy and her contact at Holiday House, discussing today’s market for nonfiction in children’s publishing. 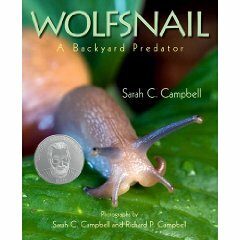 Wolfsnail Update: Wolfsnail: A Backyard Predator is showing up on all kinds of summer reading lists — including the Chicago Public Schools‘ list for grades 3-4. Wolfsnail was also featured on a podcast produced by the Cooperative Children’s Book Center. Here’s this year’s podcast archive. Click to hear Episode 48. The Wolfsnail booktalk begins about 7 minutes in and lasts about 2 minutes. Gardening Update: I picked my first cucumber today! I absolutely love cucumbers. It was delicious and there are at least a dozen more on the vine. I didn’t have time to take a photo. I gobbled the cucumber up in a lunchtime salad. I also picked three zucchini and a handful of beans and snap peas. It is so very hot out there (97 degrees today) that I don’t know how the plants can stand it. They’re drinking lots of water. I hope the tomatoes ripen soon.